Painting on silk begins with a luxurious base of precious pure white China silk stretched tightly on a frame. I use the combination of imported French silk dyes and a resist of Gutta (which is like a rubber cement). Sometimes I will use a hot wax resist. The purpose of a resist is to stop the flow of dye and create a barrier, which makes the outline of an image. 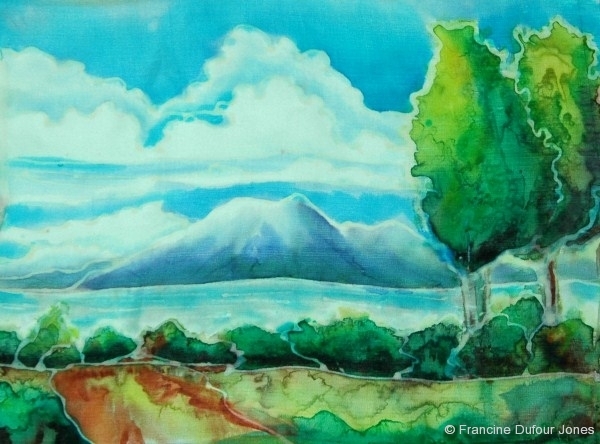 One of the things that excites me the most about silk painting is the purity and the intensity of color that can only be achieved by this unique technique. After the painting is complete I steam the silk for many hours. This sets the dye and increases the intensity of the color. It also makes the painting very permanent and durable. The silk pieces can be washed or dry cleaned. It is not advisable to hang silk for long periods of time in direct sunlight. Silk is a natural fiber and in time the direct sunlight will damage the silk. I always have an image and a feeling selected when I begin a painting. I can plan but never totally control what each painting will evolve into. Watching the color spread on clean silk reminds me the excitement and freedom of wild horses running across a plain with no stops! 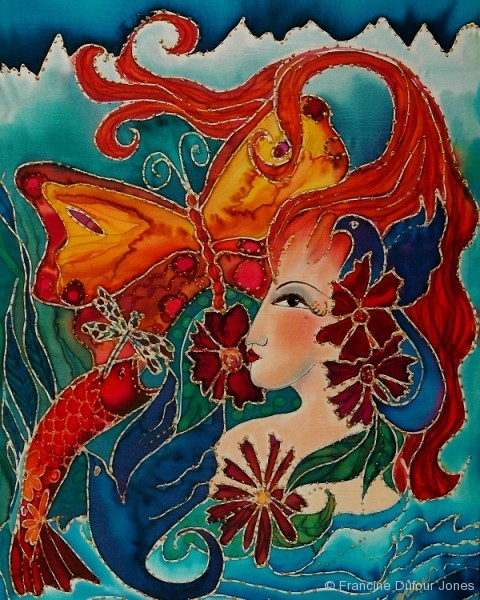 The magic of silk painting comes from the subjective images and combinations that emerge within these boundaries. It is still amazing to me how this happens. 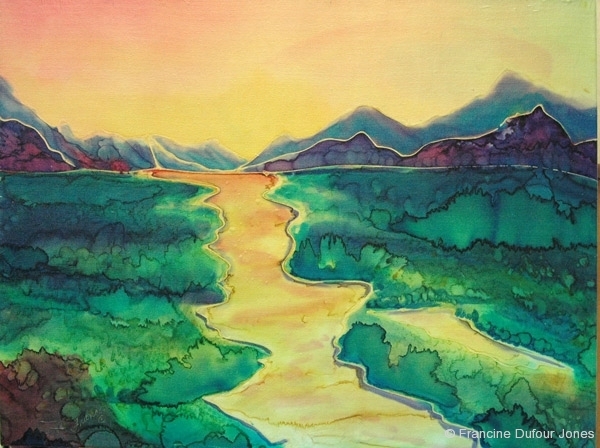 The essence of what I am painting comes through the flowing dye. Each painting is unique and is one of a kind. Silk painting is the art of applying dye to silks. Often the silks are used as scarves, ties, or clothing. 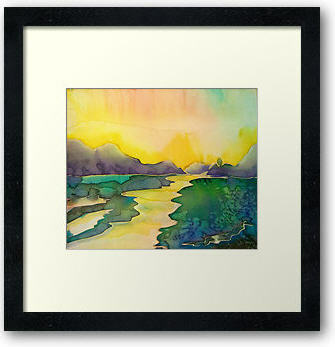 The finished works can also be framed pictures, wall hangings, or household decor. The silk seems to glow with vibrancy and a special luster, adding a wonderful animation to the painting. 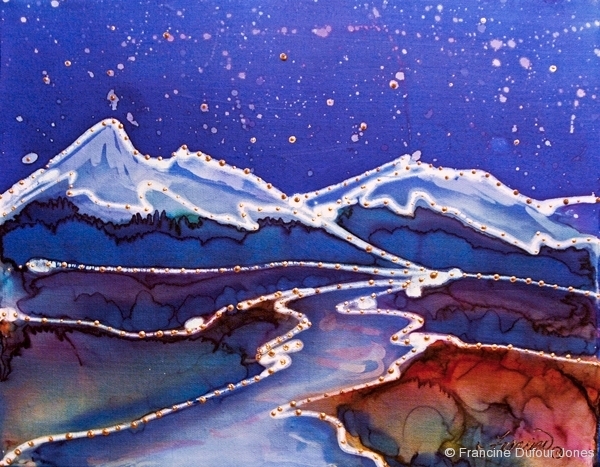 Even the simplest painting on silk is beautiful because of the glow and warmth of the silk shining through. 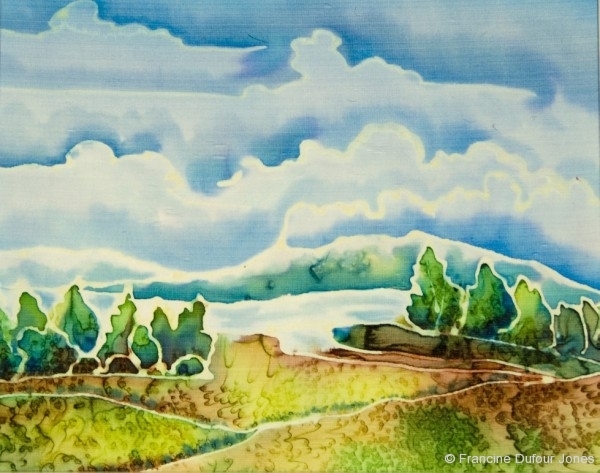 Silk painting is almost the opposite of other types of painting. Generally, the artist paints by controlling the placement of pigment on a surface, usually through the use of brushes. 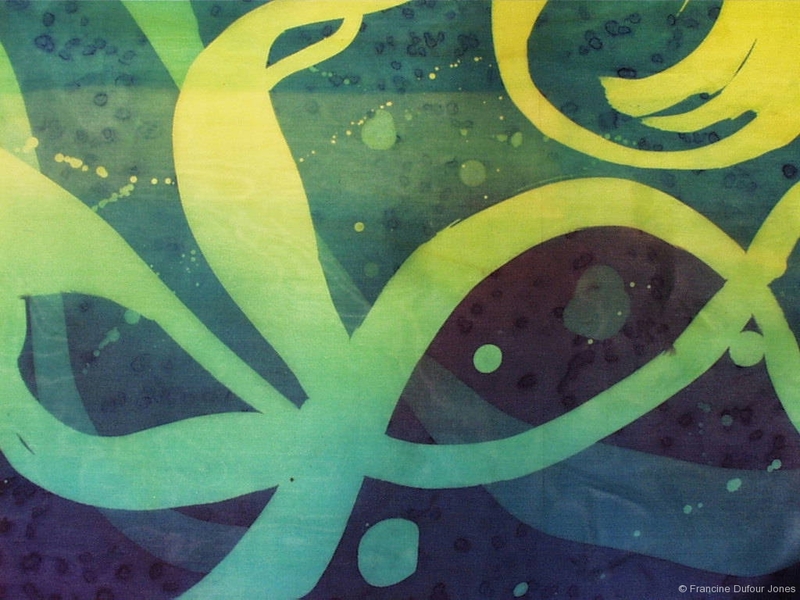 In silk painting, the painter controls the movement of dye within boundaries such as a resist on the silk. Brushes become much less important because the dye will move on the silk after it is placed there. Because the dyes flow so freely on silk, the job of the silk painter is to control the movement of the pigment on the silk rather than its placement. The basic technique for most silk painting begins by drawing the outlines of the design with a rubber-like liquid. When the liquid “fence” is dry the silk dye is allowed to flow within each segment of the picture. The result can be uniform fields of color as in two-dimensional cartoons or stained-glass design. The result can be uniform fields of color as in two-dimensional cartoons or stained-glass design. The challenge to silk painters is to add dimension and to vary the effects on the surface. Silk painters use some of the same techniques as watercolorists to create unique designs: use of salt, alcohol effects, wet-on-wet treatment, and wet-on-dry painting. However, the effects on silk are often more dramatic than on paper. Techniques usually have to be applied in different ways on silk than they are used by watercolorists. Modern silk painting became extremely popular in France over 100 years ago. The dyes used are still called “French dyes”. The special dyes are brilliant, versatile, and most of all, leave the fabric soft. I also have a more in-depth online course on silk painting. Click Here for more information. 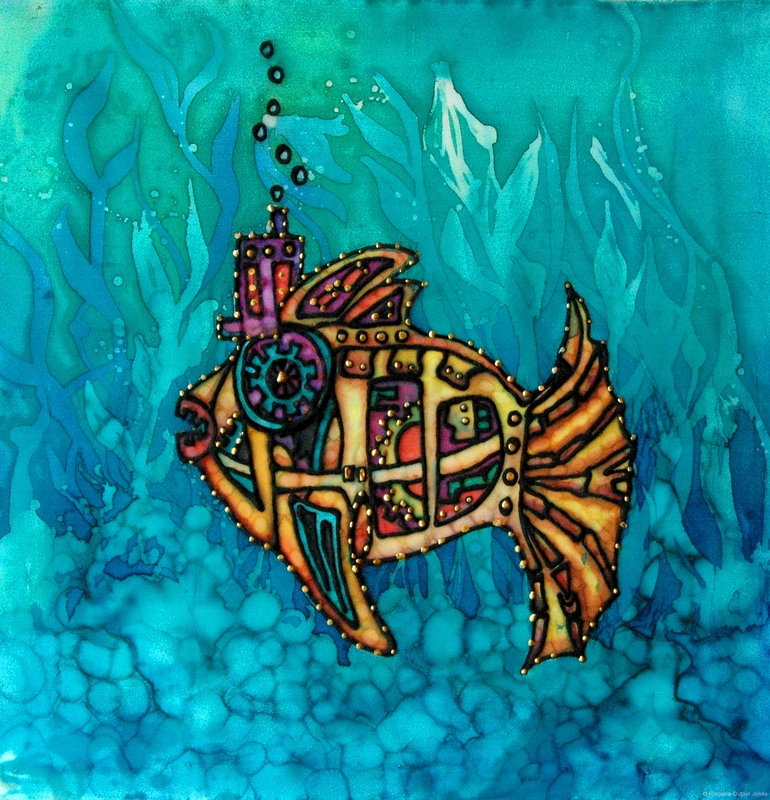 I have fine art prints and original silk painting available for purchase.